North Korea’s leader, Kim Jong-un, has warned the United States his country’s nuclear forces are now “completed”, adding that the nuclear launch button was always within easy reach. While he remained defiant in his confrontation with Donald Trump, he struck a more conciliatory note on relations with South Korea, offering to start talks on sending a North Korean delegation to the upcoming Winter Olympics in Pyeongchang. 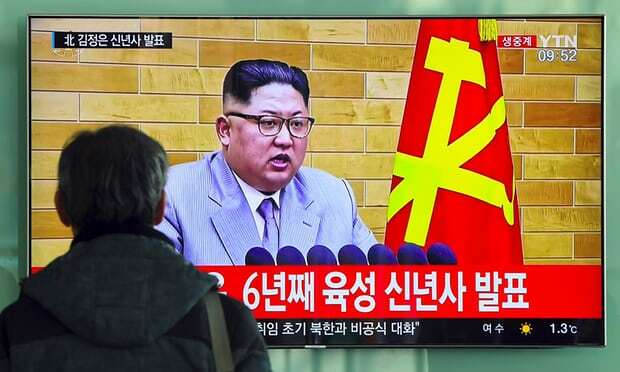 After a year in which he ordered a string of missile launches – including three intercontinental ballistic missiles – and the regime’s sixth and most powerful nuclear test, Kim used his annual New Year’s Day address to declare the North’s nuclear weapons capability a reality. “We achieved the goal of completing our state nuclear force in 2017,” Kim said in a speech broadcast live by state TV. “We need to mass-produce nuclear warheads and ballistic missiles and accelerate their deployment. Kim said North Korean athletes could participate in the Winter Olympics, which open in the South Korean town of Pyeongchang next month. South Korea’s president, Moon Jae-in, has encouraged Pyongyang to send a delegation to the Games, hoping their presence would help ease tensions on the Korean peninsula. Kim said: “The Winter Olympic games that will be held soon in the South will be a good opportunity to display the status of the Korean nation, and we sincerely wish that the event will be held with good results. The Winter Olympics will be held from 9-25 February, followed by the Paralympics from 9-18 March. 0 Response to "Kim Jong-un: North Korea's nuclear arsenal is now complete"